Let me start out by saying that this isn't one of those hacks where you start with one thing and by the end you have some other, amazing thing. My project started a step stool and ended a step stool, but I learned quite a bit my first time tackling a project like this and I thought I'd share! Let's start with the BEKVÄM shall we? We picked it for it's simple, two step design. 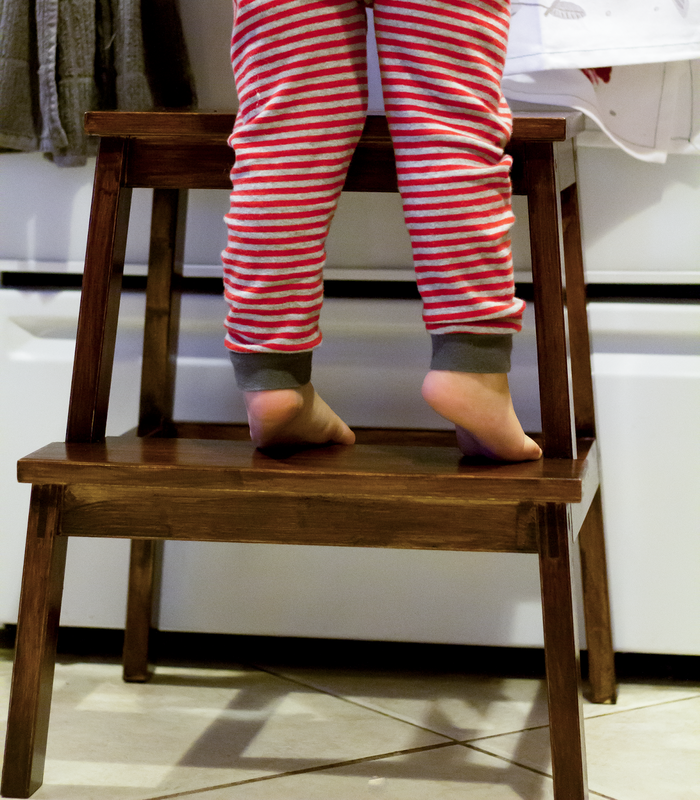 It's nice and tall, the perfect height for Jacob to stand and help at the kitchen counter, and for me to reach things way in the back of our top shelves. It comes in three colors - black, white, and unfinished birch. I didn't love any of them so I decided to make it my own. I bought the unfinished birch figuring it would be a good starting point since there was no paint to strip away. Here's a little before picture. The stool felt a bit shiny to me when it arrived so after assembling it I gave it a once over with our sander just to be sure there wasn't any finish on it. Once it was sanded my first step was to apply some dark wood stain. I picked a color called provincial and got to work. Here are some tips I learned along the way. 1. Use a cheap foam brush that you can throw away when you are done. Trust me you are NOT going to want to try and get wood stain out of a brush. It's nasty stuff. 2. Apply the stain liberally, going with the grain, covering your surface. 3. Let the stain sit for 5-10 minutes and then wipe any excess off using duck cloth. 4. Allow the stain to set according to the directions on the can, then give it a light sanding. 5. Repeat. My can actually said to apply 3 coats, so I trusted them and did. Once my third coat was completely dry I wanted to add a poly coat to seal in the stain and protect it from any splatters in the kitchen. I used a water based poly seal and again used a cheap brush I could throw away. 4. Repeat according to the directions on the can. I went over it three times. And here it is! It's not perfect, there are a few spots where the stain didn't take as well, but I'm pretty proud of my first try tackling a project like this! 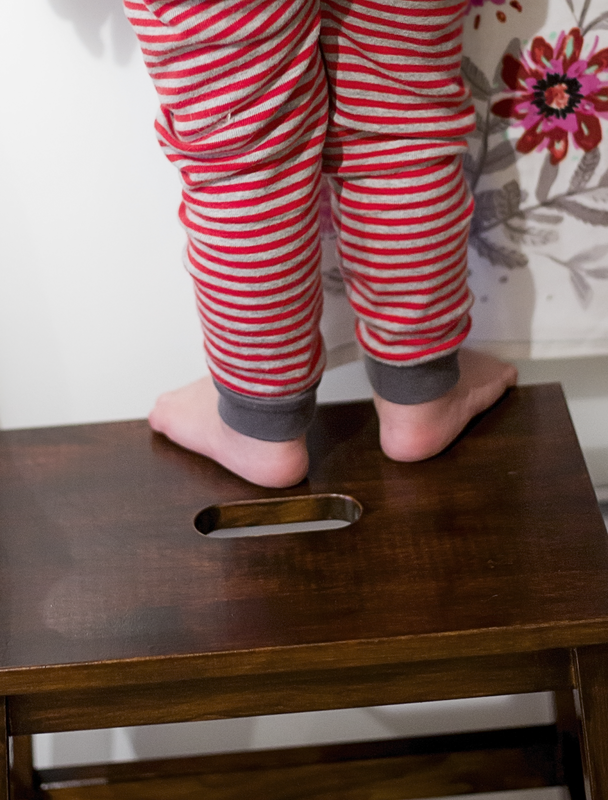 1 comment on "IKEA hack: BEKVÄM Step Stool "